Ashton joined our staff in August of 2013. 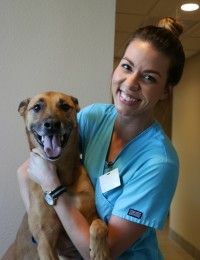 When she is not caring for our four-legged patients, she is studying to become a doctor for the two-legged kind. She loves pizza, pugs and live music. She has three fur-children at home: Cats Fiona and Thomas Jefferson, and canine step-daughter Judy (pictured).